A lot said, a lot written but in the end nothing done. No replay, no hope, the Irish nation, and those of us who have moved away, mourn one of the greatest injustices in the history of football. And how galling to have perhaps the best player to ever play for the country telling us to get over ourselves. Easy for you to say Roy Keane as you earn a comfortable wage for guiding Ipswich to relegation while the millions back home struggle to cope in the worst economic crisis in the history of the republic. Qualification on Wednesday would have been a boost for a whole football mad nation. Who knows what the knock on effects of reaching the World Cup might have been for the people, for the economy for the future of our struggling nation. Instead we were robbed at the hands of Thierry Henry’s will to cheat, the incompetence of a referee and linesman and the corruptness of FIFA. 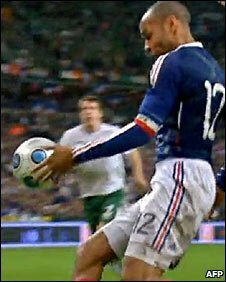 How surprised are we to see no mention of the dubious handball on FIFA’s website and the utter silence of the most powerful man in football, Sepp Blatter who decreed that the World Cup play offs would be seeded just weeks before the draw, an illegal move if ever I saw one. Now I must admit to being a little embarrassed to see FAI chief executive John Delaney plead for a replay on the basis of some precedent set in some obscure Asian qualifier a few years ago. A replay was never going to happen but then we are all a bit desperate for something to cling to and the emotion of it all is raw. But Delaney did make one good point in that this wasn’t a league or group game whereby the situation could have been redressed. This was a one off situation, a winner takes all scenario. Ireland will not get chance to redress what happened on Wednesday. Instead they’ll spend next summer watching the greatest show on earth on TV. And I doubt any Irish people, I know I won’t, will take pleasure in watching the World Cup next year, knowing it should have been us and not the French that are competing in South Africa. Even the French themselves are embarrassed by it all. It is the great shame of a great footballing nation, world champions just over a decade ago, that they have cheated their way to the finals with the help of one of their greatest ever players. And what gall for him to come out and call for a replay not long after FIFA and his own football association absolutely ruled out the possibility. A cynical PR move from a player once respected throughout the world but who will now be remembered as much for as his talent as for his will to win at all costs, even if it means cheating, handling the ball not once, but twice. Surely this is a landmark moment in football. The calls for video evidence, extra officials, or something to cut this out are deafening and must be acceded too. A system whereby a referee can stop the game a limited number of times to look at a 20-30 second play back on a controversial incident might work. Failure to implement something that will prevent or at least lessen the chances of incidents like Wednesday’s happening again will only tarnish the game further and make a lot of people, me included, lose faith in a sport that is increasingly allowing cheats to prevail.